Clouds of dust lifted from the concrete and swirled in the red glow of Sarah’s tail lights as her car crept down the broken pavement leading to the retreat. After an entire day on the road, with a watchful eye on her rearview mirror, she was still not confident that Wade was not following her. Trees and thick shrubbery lined the narrowing road, and a deep ditch on each side made it too difficult to turn around to go back. She released her breath in relief and drove through. The road became gravel and the trees and shrubbery cleared into an open field of weeds, so far as her headlights could see. A clopping sound came from behind and Sarah pressed on the brake to come to an abrupt stop. It was the sound of galloping hooves. She twisted around in her seat and spotted the silhouette of a large man on horseback. He climbed off his steed and hurried to the gate to close it behind her. Her heart sped up. She couldn’t see his face, but could feel the icy glare coming from the dark outline of the man as she pulled her car away from him toward the welcoming light of two houses. As Sarah bounced her focus from the man behind her to the houses in front of her, a paunchy woman in a purple winter coat came from one of the rustic structures and walked up to her car. Sarah rolled down the window. “Welcome to the Helping Hands Retreat, dear.” She oozed with kindness and gentility. “Of course you are.” Her voice was sugar-sweet and comforting. “Something like that—” Sarah was on guard and reluctant to trust this woman. She was reluctant to trust anyone. “That’s what we do, dear. You’re in the right place. Come in. You just missed dinner, but we can get you a room for the night if that might help.” She interlaced her white-gloved fingers and held her hands near her heart. Sarah, exhausted from an entire day on the road, and needing shelter from Wade for the evening, brushed her skepticism away and accepted the woman’s offer, whether she was in the right place or not. “That would be wonderful,” Sarah said. “I’m Mary,” the woman smiled. The premises were not as upscale as they appeared in the brochure, but Sarah didn’t care. Perhaps it looked better in the daylight. She followed the small waddling woman to the steps on a simple rectangular house. Each of the three steps crepitated beneath her feet as she climbed to the entrance. There was no time to pack a bag when she left home that afternoon, so Sarah arrived at the retreat empty-handed. The cool mid-November air chilled her skin, and reminded her of the bruises that Wade left on her arms. He would find her soon. He always had a way of finding out where she was. Mary left Sarah in room number four, gave her a key to the room, and a welcome package complete with a fresh towel, toothbrush, toiletries, and a set of hat and gloves to keep warm. The package gave her a feeling of indignity—like a homeless person—but that’s what she was now. Eight rooms stretched along one side of the hallway inside, similar to a hotel. On the opposite side of the hall was a shared bathroom and a common room, but all of the guests had retired for the evening. Strange to Sarah, considering it was only seven o’clock, but she was so thankful to be away, that she washed up and retreated to her room for the evening without any questions. The room was drafty and cold, and the gentle sobbing of a woman could be heard through the wall. The soft blue glow of moonlight seeped in from behind the curtain of her private room, exposing shadowy lines—bars on the windows. A further peer into the darkness outside the window revealed a large open field fully illuminated by the moon. It was at least thirty acres to the edge of the property where the fence laid. Plenty of room for the horseback riding that she had seen on the brochure. As she dreamed about her potential new life, she felt it again—an icy stare. Eyes watching her. She tried to shrug it off as paranoia about Wade following her, but it persisted. She closed her curtains and walked barefoot across the creaking wooden floors and froze in the middle of the room. The feeling was still there. 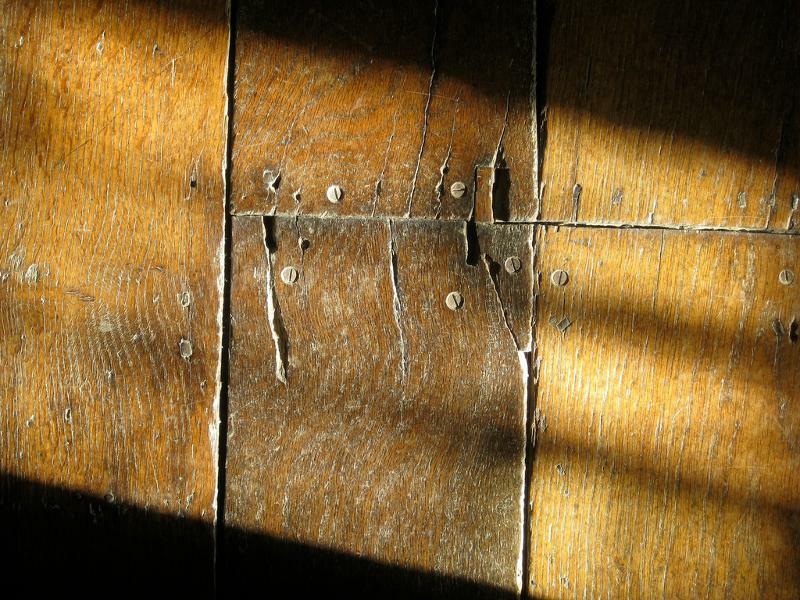 From under her right foot, she could feel a gentle upward pressure from underneath the floorboard, then a swift sound of scuffing below. Sarah gasped and jumped to her bed, staring down at the floorboards as the clunking, slithery sound from under her room waned. Her blood pumped through her veins so hard, she felt sick to her stomach. “Hey!” Sarah said toward the floor then leapt from the safety of her bed to run to the window. A shadow, consistent with the shape of a person, darted out of view around the side of the house. “Did anyone see that?” Sarah said through the walls, but there was no reply. Screaming began only a moment later. The deep, throaty voice of a man that sounded like it belonged to a giant, was crackling and crying out from somewhere outside the house. Sarah shoved her feet into her shoes and left her room, then crept down the empty hallway to the outside door, and gripped the knob. It wouldn’t turn. “Hello?” She spoke with a firm voice, while she held the door knob within her shaking palm. She shook it harder, but it was locked from the outside. Sarah backed away from the door as the realization of the surrounding danger kicked in. It was a familiar feeling. It was the feeling she got before Wade would go into a rampage. Her vision would tunnel, her heart would throb harder, and she would become still as she awaited his outburst. But nothing came. She went back to her room, trembling with fear, and then climbed into the bed awaiting her fate. In the morning, sideways light from the rising sun glared through her window and through the lattice woodwork on the crawlspace beneath the house. She peeked through the cracks of the floorboards to see the dusty brown earth below, and enough room down there for a grown man to crawl underneath. “Coyotes,” Mary said when Sarah asked her about it, standing in the doorway of her room. “So there are dangerous people here?” Sarah watched as those people passed by her to exit the house. Most kept their heads down and didn’t look, but one gray-haired woman peeked from under her silvery strands to give her a glance. “You don’t sin?” Mary smiled. “It’s my job to know. Come now.” Mary guided Sarah outside into the cold dry air. Her tiny gloved hand pressed between Sarah’s shoulder blades to direct her to the next building. “Where’s my car?” Sarah asked, crossing her bare arms to keep warm. Sarah’s blood turned cold at the sound of his name and her survival instincts kicked in with the new looming threat. Though she wasn’t sure what was going on, she knew how to protect herself from unpredictable people. Until she could figure out what to do, she would keep her head down and be compliant, like she had done with Wade for all those years. She entered a cafeteria space with a wood stove in the corner that did not generate enough heat to keep the drafty old building warm. Five guests were already seated and eating at the two round tables. They were still wearing winter hats and mittens while they shoveled the food into their mouths without exchanging words. Sarah, with Mary still perched beside her, approached the breakfast bar and was scooped a meager pile of scrambled eggs by the gray-haired woman. She was wearing green latex-free gloves and a hair net. She looked to Mary, then back to Sarah. “Are clean hands,” the gray-haired woman muttered the words in a reflexive way. “Thank you,” Sarah said and sat at a table with three others. A man with spiky black hair poking out from under his hat and weeks’ worth of beard growth rocked in his seat across from her. He kept his hands tucked between his knees and his eyes on the pile of rubbery yellow eggs before him. His gaze broke from the eggs when Sarah sat down, and he stared at her pale and bruised hands. “I washed them,” Sarah insisted. “Now, Jacob,” Mary approached him from behind. “It’s not fair!” He yelled with spit strung between his lips. “—are clean hands.” Six voices from around the room said it in consonance. After breakfast, Sarah was given a thick flannel work shirt and a pair of heavy duty work gloves. “Come on, dear,” Mary said, and led her outside where the other six other guests of the retreat were pulling weeds along the entrance road. A large man on the back of a brown-and-white horse sat near the entrance with his arms crossed and a shotgun slung over his shoulder. All of the guests were wearing the same black-and-red flannel that Sarah had on. She pulled weeds and piled them neatly into a wheelbarrow, and caught the gray-haired woman staring at her. Her large round eyes were backlit with urgency. Some warning hid in the intense glare, but her lips remained shut. Sarah continued to keep her head down, pulling weeds with the others, hour after hour, wondering what was going on, and how she was going to get out of this place without incident. Her nose turned pink, and her fingers numbed from the icy air, so Sarah removed her work gloves and rubbed her hands together. The motion caught the attention of the woman with gray hair, and she watched as Sarah blew warm, moist air onto her skin. The man on the horse looked in her direction, squinting to see her pointing to the westward wall of perimeter fencing. A coyote was pacing at the fence line. Tom nudged the horse with his heel and trotted off the gravel road, away from the open gate, and took aim at the coyote in the distance. It was too far, so he edged closer, and took aim again. As he did, the man with the black spiky hair shifted his twitchy eyes back and forth, then darted toward the gate. Dust kicked up behind his boots as he sprinted along the gravel, unnoticed by Tom and Mary. They were both focused on the coyote, but the guests and Sarah swung their attention back and forth between the running black-haired man and the man with the gun. It seemed like a smart idea—to run—but Sarah knew better. There was nowhere to run to, not with a man on horseback and a gun nearby. She knelt down and went back to picking weeds, waiting for her opportunity, while the black-haired man escaped the open gate. The shot gun fired, blasting up a chunk of dirt at the coyote’s feet, scaring the critter away. “Damn,” Tom shouted, disappointed with his miss. “Tom!” Mary yelled again, this time pointing toward the runner, and Tom spun his horse around to chase him down. Everyone was staring as that horse closed in on his pursuit, but Mary redirected them. “Come on folks,” Mary said, “I think that’s enough of that for today. Let’s go back to your rooms for a while.” She gestured for them to follow her as Tom chased the black-haired man into the woods outside the gates. Sarah got in line with everyone else and walked back to her room, concealing the terror within. The gray-haired woman went into room three, next door, still with grave warning in her eyes. Sarah paced her room until the sound of a gunshot in the distance, and a bullet cutting through the air, made her freeze mid-step. Her feet were heavy on the floor, like gravity could yank her through the wooden planks. Sarah dropped to the floor to inspect the wood and the cracks between. They were old boards that bowed under the weight of her feet, and the rusty nails that held them in place were eroding in their holes. She pried on a board where it appeared to be weakest, and the edge lifted up. Her fingers would not fit between the spaces to get enough torque on it, so Sarah dug into her welcome basket of supplies and used her toothbrush for some leverage. She wedged the board upward, and the nail came with it, wiggling out of place with minimal effort. She got to work on the second board—three would be enough for her frame to squeeze through. The boards came loose and she stuck her head into the space beneath the house. It was still too light outside to make a run for it. She needed to run under the cloak of nightfall. She was sick to her stomach and her instincts told her to run—to get out, but she had to be smarter. It had to be the right time. She placed the boards back into position and waited impatiently on her bed as the daylight lingered. There was a knock at her door. “Sarah, dear?” The soft voice was absorbed by the old wooden door of her room. “Yes?” she asked, as casual as possible. Mary opened her door and Sarah stood to greet her. “Mary, may I ask—” Sarah kept a kind, respectful voice. She unclasped her white-gloved fingers and spread her arms apart as if she were an open book. “You don’t deserve…” she laughed. “It’s not about what you deserve. It’s about cleansing our hands of our sins and becoming a better community in the process, because helping hands…” She paused and waited for Sarah to reply. “Hush now. It’s been a long day.” Mary left. The sun set at five o’clock and Sarah sat against the wall on her bed and waited for the sky to darken. “Don’t worry,” a voice made its way through the wall from the adjoining room number three. It was the gray-haired woman. Sarah got to her knees, palms and ear to the wall to listen. “It hurts bad the first time, but you get used to it,” she said. Don’t run. Don’t fight. Sarah had spent too many years enduring attacks from Wade. Fight or flight should be a natural instinct, but instead she cowered and stayed, for far too long. She couldn’t do it anymore. She was determined to run this time—or to fight if she had to. “He watches us from under the house.” The gray-haired woman was solemn and desperate. While the gray-haired woman talked, Sarah knelt down to remove the loose planks from the floor. Twilight was darkening and the moon was rising in the east above the tree line. Heavy feet clomped on the stairs out front—two sets of feet—and Sarah lowered her body into the crawlspace with her only chance to run. She returned the planks to their position, haphazardly, and crawled toward the open latticed board at the edge of the house. The front door opened and Tom and Mary could be heard walking down the hall. Sarah crawled out from under the house and crouched down to be sure to stay out of sight, but curiosity and the light from room number one, drew her to investigate. The curtains were almost shut, leaving a two-inch gap that allowed a strip of light to escape from the window and onto the ground. Sarah peeked inside, adjusting her position with precision over the gap to see part of Tom’s body standing in the room. A five-gallon bucket was placed on the floor and the guest in room one removed his work gloves to expose a set of raw, burned hands. They were pink and shriveled. Instead, she ran. She sprinted across the blue moonlit field toward the entrance gate that was wide open. She would come back with help. The cold air sliced through her lungs as she made her way off the property and down the beaten old road. It was at least two miles to the next road, if she remembered correctly. Get help—she chanted under her breath, and with each step, she pushed harder and faster. In the distance, there was a set of headlights, but the ephemeral beacon of hope vanished when Sarah considered that the driver of that vehicle may someone that couldn’t be trusted. She darted off the road, into the ditch, and took cover in the thorny brush, as a pickup truck blasted by, music thumping, heading toward the retreat. Sarah had never been so terrified, not even when she was with Wade. Not even when he had held her by the throat, threatening her life. Sarah pressed forward, and after several minutes, her run slowed to a jog, and she wondered at what point she’d hear the sound of hooves galloping up behind her. But she never heard them. The man in the pickup truck left his music blasting as he pulled through the gate of the Helping Hands Retreat. “What the hell?” He said as a little woman shuffled out of the house toward his vehicle. Tom stood in the doorway, holding the five-gallon bucket, as moaning sounds of pain poured out behind him. “I’m looking for my wife.” The man scowled. “Have you now?” His arrogance and belligerence was transparent. “Did you know she took off with my car?” Wade got out of the truck and put his hands in his pockets while Mary guided him toward the house. This entry was posted in Issue 17:1 and tagged Contest Winners, Dead of Winter, Fiction, Red Lagoe by TC Editors. Bookmark the permalink.